To put it simply, this is one of the best books that I have ever read. I loved it and was so sad when I came to the end. So exquisitely well-written that I took a week to read it, THE FIFTH GOSPEL is well worth the ten years that it took to research and write. So richly full of detail that the characters start to feel like friends almost immediately and so easy to get caught up in that at times it had me weeping. The story is about two brothers, Simon and Alex. Both men are Catholic priests and live in the Vatican. Alex is a Greek Catholic and has a small son, while Simon is a Roman Catholic and destined for high places. The story begins with a phone call. Simon, who is currently stationed overseas, is coming home but phones Alex needing his help. Hearing the panic in his brother’s voice, Alex dashes out to his aid and discovers him crouching over the dead body of Ugo; their friend and the curator/designer of a mysterious exhibition that is due to open in the next couple of days. Ugo has been shot. The police are called and an investigation begins but it is no ordinary investigation. Simon is arrested, under suspicion of the murder of his friend, but the trial is set to take place in a Catholic court in the Vatican, not a court of Law. The system is very different and Alex, frustrated at what he sees and frantic for justice to be served – both for his brother and his friend - starts to take matters into his own hands. Ugo’s planned exhibition is a controversial one and it is obvious that someone has killed him because of his discoveries in the course of preparing his work. He has spent a couple of years researching the origins and authenticity of the Shroud of Turin, in an attempt to explain where it really came from and whether or not it was the fake that carbon-dating had shown it to be. During the course of his research, Ugo had found an ancient manuscript, called the Diatessaron, or Fifth Gospel. It is a mix together of all four other Gospels, in an attempt to make sense of the discrepancies between them. Ugo works hard at unravelling the truth behind the Shroud and scours the Diatessaron for clues. What he finds has the potential to rock the very foundation of the Catholic church. And someone clearly wants him silenced before he tells the world his news. Alex is pushed to his limits trying to find the evidence he needs. Gutted that his friend is dead and determined to prove that his brother is innocent, he has to push aside his own breaking heart and get to the truth before it is too late. Then he discovers that he too has become one of the hunted. 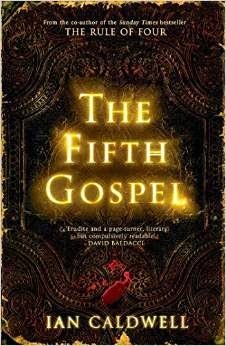 If you love religious crime fiction and cherish well-written prose as much as I do then you are going to adore this book. It deserves to be at least as successful as Caldwell’s earlier work. I will be watching its progress with great interest.